This Office Sign Is Double Sided to Display Simple Messages. It Will Be A Great Addition for Any Business. Order This Office Sign Online for More Savings! 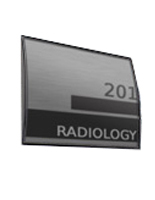 3.75" x 8" 3.75" x 15" 5.75" x 6" 5.75" x 9" 8.5" x 11"
Double-sided allowing message to be viewed from both directions. Non-glare overlay included to prevent reflection. Fast and easy graphic changes with suction cup provided to lift-up the front lens. 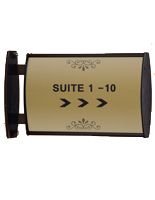 This business office sign is a perfect wayfinding system to direct visitors to the right destination. 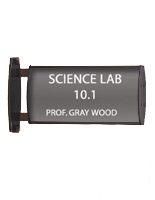 The aluminum frame is designed to display room numbers, directions, a title or department names. 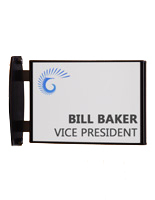 This name plate, interior office sign is made to hold two 5" x 3-3/4" printed graphics. The signage or artwork can be easily printed directly from a regular printer. 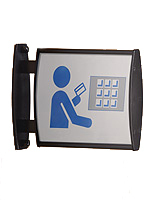 This office sign, also known as a directory holder, is constructed from high quality aluminum with a black finish for used in any business environment. The universal design of this wayfinding system enables users to make use of them for years. 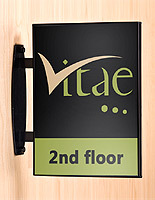 This business signage, office sign can be used to hold a landscape or portrait print. 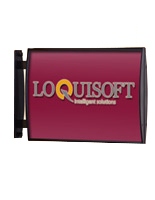 Graphics changes are relatively fast and easy with this display system. 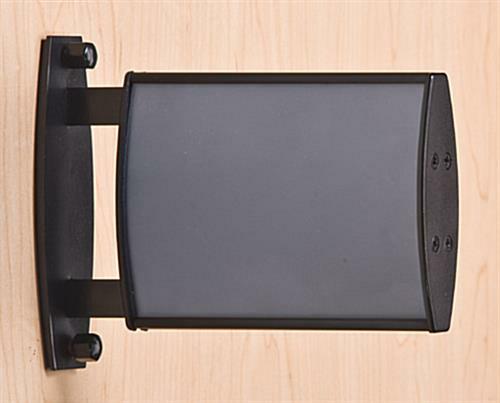 Users can use the suction cup provided to lift-up the front non-glare overlay without detaching the office sign that mounts to the wall. The non-glare overlay is designed to protect signage from getting ruined and prevents reflection, making it easy for visitors to see the details. This office sign that has a curved design is sure to make the graphic stand out from the aluminum frame. The wayfinding system, like the one seen here, can be easily mount to any flat surface. To mount the unit to the wall, users are required to attached the steel bracket to the surface first and then connect the room number holder to the steel bracket with the decorative nut caps. This office sign that is two sided maximizes exposure and is great for use in open areas like lobbies, schools, libraries, airports, universities, banks, hospital hallways, government centers and shopping malls. This flag display is available in many other sizes as well (see related products for more options). 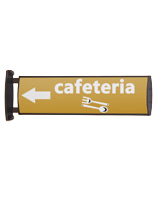 Buy this wayfinding signage in bulk to get more savings! 8.3" x 5.1" x 1.6"